As the Los Angeles Times and hundreds of publications scramble for confirmation that the rumors originally broken by TV Guide are true — CBS will give Jericho fans a season two in the form of an eight-episode run mid-season — we can't help but to look at some side bar social media stories, three of which are on YouTube. Cast Campaigns. 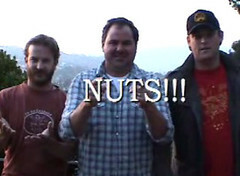 Actors Richard Speight, Bob Stephenson, and Brad Beyer took to YouTube to thank Jericho fans and prove they know how to spell "N ... U ... T ... S" while boosting the fan campaign by playing the Peanuts theme. Fan Advertising. One fan, going by the handle "RubberPoultry," produced a Jericho Season 2 promo that jazzes up the fan base, but then reminds people that Jericho won't be back unless they do something about it. YouTube Documentaries. While it might be a little long in the tooth at four minutes, the "Nuts!! to CBS Delivery Collection" captures some of the emotion behind the message boards. We can forgive the length, mostly because of the dubbed WWII movie segment starting at 2:54. Funny stuff. There are dozens more, but these three are among our favorites. They represent a shift in video communication created by social media. It's the very reason public relations professionals need to brush up on some new skill sets. Jericho fans dazzled us by filling forums, bolstering stories, signing petitions, making videos, getting press attention, shaming entertainment writers who said it could not be done, and, of course, shipping off 40,000 pounds of nuts. Sure, today it is CBS, but tomorrow it might be your company that finds itself dealing with a new brand of crisis communication. Social media has turned passive viewers into active consumers, given cast members the ability to address fans direct, and proven that no one should underestimate a dedicated group of individuals who happen upon the least likely, but amazingly effective, message ... NUTS! We look forward to reading the official "resurrection" announcement from CBS before providing a post-show wrap up. If Nina Tassler, president of CBS Entertainment, needs any inspiration, she can find it scripted for her back at the bottom of our May 26 post. We won't even send a bill. Another fantastic article! Thank you! We anxiously await the statement from CBS. Bring Jericho & its' fans home, please. I have to say that I have thoroughly enjoyed all you posts over the course of the NUTS campaign. They have been insightful and instructional at the same time. You have really stepped up to the plate through your tellings over the past few weeks. I think I speak for most "Jericho" fans when I say a hearty THANK YOU. Hopefully, when (and I say when) the new season premieres, you'll be ever so gracious and let all your readers know of the date. In all seriousness, thank you to Brad, Bob and Richard and thanks also to Rich for continuing to keep the Save Jericho team motivated! Save Jericho, Brenda, MK ... thank you very much. "How about those production values?" Ha! Sometimes I think production value is the real beauty of it all. In all seriousness, I'm happy to hear from some Jericho fans that they are becoming part of my readership. While its not a tv blog, it certainly motivates us to keep things, um, fresh. Thanks! Love you much, once again! Hope we can soon pop open the virtual bubbly together! Great piece(s) on this campaign. Indeed a fascinating study on how this happened...not just THAT it happened.